Now that you’ve purchased a bike, you’d want to make sure that it remains yours. Both the Government and the Police department give low priority to bike theft incidents. However, according to a research, the bicyclists are four times more likely to be the victims of theft than drivers of motor vehicles. Hence, while the Police and the Government might suggest otherwise, the issue of bike theft is not a trivial one, at least not for us bike lovers. Thus, in order to make sure that your bike remains safe and sound, we have decided to unveil the best bike lock of 2017. In our search for the best bike lock, we made sure to go for those locks who are inexpensive, could be easily used, and are applicable for a wide range of bikes. Ready to make sure that your bike remains off limits for the thieves? Let’s start from the first step. ​How to determine the strength of lock you need? 1- What is your living place? If you live in a big city, university or college campus, your bike is at a higher risk of being stolen. However, if you live in a small town or village, your bike is less likely to be stolen off. 2- Do People praise the looks of your bike? One of the best methods, determining whether your bike attracts second looks or not will go a long way in determining the level of security it needs. For example, if your bike is being noticed everywhere you go, it is very likely that the thief will come after it. 3- Do you leave your bike unattended? If the answer to this question is in affirmative, beware as someone out there might gauge this habit of yours. However, if you rarely leave your bike unattended, there is less reason for you to worry. If the answer to any two of the above-mentioned questions is in affirmative, you should look for a lock that provides a higher level of protection. In reverse scenario, even a lock which provides a lower level of protection would do the job. How to determine the Strength of a Lock? With due respect to the manufacturers of bike locks, no bike lock is indestructible. So, you might ask, why buy a lock then? While no bike lock is unbreakable, the best ones resist the attempts of a thief for longer times. Thus, the better the lock at your disposal, the more time it would take the thief to steal your bike. Speaking in general terms, the strength of a bike lock is directly proportional to its thickness. The best bike lock are thicker and resist any tool which a thief might use. Talking about the tools which the thieves are likely to employ, news reports suggest that bolt cutters are their favorites. Since the dislocate the bike locks by crushing them through the concentration of forces on the contact point, bolt cutters are the Number 1 enemy of a bike lock. However, if you go for a bike lock which has a thickness of 16mm and above, the majority of bolt cutters won’t be able to crush them. Consequently, your bike would remain safe. However, if you’re still unsure, go for the “rating system”. For the best bike lock, they usually have a rating which depicts their security. Greater the security, better will be the rating. Since brands just want to sell, they could overestimate the ratings of their locks. Hence, in order to make sure that the rating written on the lock is correct, go for “Sold Secure” Ratings. An independent security rating company, Sold Secure ratings come in three types: Bronze, Silver, and Gold. If you want the utmost security, go for the Gold level. However, if the risk factor is small, silver ratings would also do the job for you. Choosing the right type of lock is as important as choosing the right type of security. In addition to making your bike secure, a right type of lock would be user-friendly, inexpensive, and durable. Stating that a lock should be user-friendly is very easy for us. However, for the customers, the term “user-friendly” could be vague. What does it mean? Does it mean for the lock to be easily installed? What about the weight, length, and SOP’s of the lock? Has it got to do anything with the portability of the lock? Eliminating the riff-raff, there are three factors which make a lock user-friendly: it has an optimum weight, easily portable, and comes on/off easily with a key. Generally speaking, bike locks come in four different categories. In addition to the differences in the security that they provide, these locks can be differentiated from each other in terms of price and practicality. Let’s take a detailed look at the type of locks. If your grandfather was an avid driver, it is likely that he would have encountered with these locks. The cheapest locks available in the market, U-Locks are also the most lightweight. However, as any cyclist might tell you, they are very difficult to transport and doesn’t fasten around big objects. However, if you don’t want to spend astronomically on a bike lock, look ahead as we’ve reviewed the best cost-effective U-Lock available in the market. 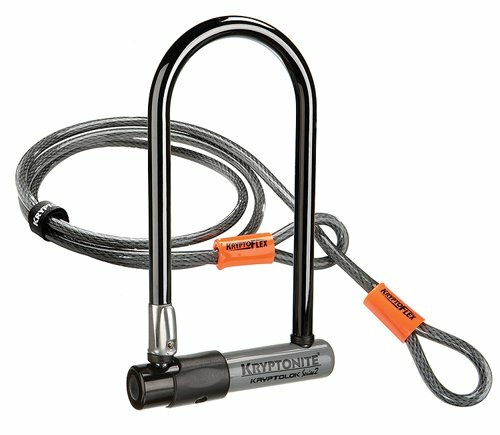 The Kryptonite Bike Lock with 4-Feet Kryptoflex cable is the most cost-effective U-Lock available in the market. With a 13mm shackle diameter, a Sold Secure Silver rating, and a practical size and weight, this lock comes at a very reasonable price. As you might guess, the 13mm Shackle diameter would not be able to resist all cost cutters. However, as suggested by the Silver Rating, only the biggest bolt cutters would be able to circumvent these locks. Thus, if your bike is at a “Lower Risk” of being stolen, this lock should do the job for you. If the price is of no concern to you, going for the New ﻿﻿﻿York Fahgettaboudit Mini is the simply the most secure lock available in the market. Awarded Gold Rating by Sold Secure, it is easily portable, has an 18mm thickness and is coated with a thick vinyl coating to epitomize the protection level. Thus, if your bike is at a “High Risk” of being stolen, and you’re looking for the best level of protection, this lock is a must-have for you. If you ask me, my vote goes to the Abus Granit X Plus 540 as the best lock available in the market. Despite its 13mm shackle size, this lock has been rated Gold by Sold Secure. Moreover, thanks to its lightweight, this U-Lock could be transported very easily. To increase its durability, an automatic cover is provided to protect the keyhole against corrosion and dirt entering. Finally, thanks to the ABUS X-Plus Cylinder, this cylinder is extremely resistant against manipulation. Pros: When it comes to providing the highest level of security, Chain locks could be categorized as bomb proof. In addition to being fastened easily around objects, these are very easier to transport. Cons: As you might have guessed, the fact that they are “bomb proof” makes these locks quite expensive. Also, since they are coated with additional layers of security, chain locks are often the heaviest. On the basis of their advantages and disadvantages, chain locks could be categorized into two types. First, comes the portable locks. With a thickness of less than 12mm, these are lightweight and could be easily transported. The second type takes into account the stationary chain locks.In contrast to portable locks, their thickness is in excess of 12mm. Moreover, since they’re heavy, these locks are best used as stationary security. If you want a chain lock which is short, lightweight, has a cheap chain, and easily portable, the Kryptonite KryptoLok Series 2 955 Mini﻿ deserves your attention. This chain lock weights around 1.8kgs and is Rated Silver by “Sold Secure”. However, since this lock has a chain thickness of around 9mm, it is safe to say that it isn’t the safest chain lock. Despite this drawback, this chain lock offers better protection as compared to any chain lock. Consequently, if your bike is at a “lower risk” of being stolen, the Kryptonite KryptoLok might just serve the purpose for you. Although the Kryptonite New York Noose 1275 has a chain length of around 12mm – which isn’t the best by any stretch of the imagination, it is the noose system which makes it the most secure chain lock. Thanks to the system, the usable length of the chain doubles, increasing the level of security provided by this chain lock. Moreover, if you are only swayed by facts, the fact that this lock is Rated Gold by “Sold Secure” should increase its reputation in your eyes. Thus, if your bike is at a “High Risk” of being stolen, the Kryptonite Static Chain Lock is a must-have. Have you ever wished to have a lock which could be locked the same way of your briefcase? Well, if you have, your wish has come true in the shape of Amazer Bike Chain Lock. Integrated with a re-settable combination, you could attach this lock on a cross bar or on the seat post when you aren’t using it. Another important advantage of this lock is that it is multipurpose. For, even if you have no bike and want to secure your ladders, tool boxes, or sport equipment, this bike lock would keep your belongings safe. Lastly, if you aren’t lured by the preceding benefits, the size of this lock should entice you in buying this one. Around 39’’, the links of this lock have a length of around 1.66’’ and a width of 0.23’’. Folding locks comprise of a large number of metal plates which are joined to each other by rivets. Thanks to these rivets, the plates can be rotated to fold them into a tight package. Consequently, a stiff shape is obtained which you could fasten around your bike. Talking about their pros, folding locks offer more flexibility, are lightweight, and have a greater length than U-Locks. More importantly, thanks to their “folding mechanism”, they are very easy to transport. Hence, whether you want to screw the lock into the bottle holder holes or fasten them around the bike’s frame, you could do both with huge ease. Made up of 5mm steel bars, a silicone cover which matches the color of the lock body, and a premium cylinder which provides a brilliant protection against manipulations, the Abus Bordo 6000 is the Optimum Security Folding Lock. Available in two lengths – 75cm and 90cm, this lock provides a huge range of options to choose from. Despite the fact that they are “Sold Silver”, they could be used to secure your bikes if they are at a “Lower Risk” of being stolen. If you want such a folding lock which provides the finest security – and aren’t worried about the price tag, the Abus 6500/85 Bordo Granit X﻿﻿-Plus Lock deserves your attention. In addition to providing security – which is the top feature of this lock, it consists of two soft components attached on the front of steel bars. Thanks to these components, the paint of your bike won’t be damaged. Thus, despite the fact that its weight is on the heavier side, this lock is very compact and fits brilliantly to any bike. Talking about cable locks, they are the most common out there. In addition to being inexpensive – the one major reason of their popularity, cable locks are available in a variety of sizes and shapes. More importantly, whether you want to tie the cable lock around the frame and the handle – or the frame to a nearby solid object, cable locks give you that freedom. However, if you feel that cable locks won’t serve your needs, below mentioned are some of their alternatives. Have a look. If you are going for a cable lock because it is lightweight, the Kryptonite Messenger Mini should stop you from doing it. Despite the fact that this lock has a thickness of around 11mm, the steel which is used in its production – Max Performance Steel, makes it as strong as 13mm U-Locks. More importantly, satisfying your appetite for a lightweight lock, this thin shackle makes sure that this lock has a weight of around 1.84lb. Finally, while this lock hasn’t been rated by “Sold Secure” yet, Kryptonite – with their internal rating mechanism, rate this lock as a 7/10. Thus, if you live in a “Low Risk” area, and want to go for a lightweight lock, then maybe this mini lock is the one you’re looking for. Have you ever wished that your cable lock has the same password of your social media accounts? Even if you haven’t, Wordlock CL-441-BK Solid-Brass 4-Dial Sport Padlock provides you with the opportunity to have just that. Its locking mechanism is made up of words, rather than numbers, which means that it’s far too easy for you to remember the password. However, as you might guess from its price tag, this cable lock isn’t cheap. Why? First of all, it’s the MOC which makes this lock expensive. Made up of steel with PVC casting, it is very difficult to cut through this cable lock. However, even if the thief comes up with a razor of the highest quality, it would still take him some time to go through this lock. Hence, the time that the strength of this lock would buy could prove to be a difference in whether this lock remains under your tutelage or that of the thief. Finally, looking at its shortcomings, its length isn’t the longest in the world. So, before you buy it, make sure that it would satisfy your needs. Although we have stated that cable locks shouldn’t be your first priority when other options are available, Master Lock 8143D Self Coiling Cable ﻿﻿﻿﻿Loc﻿﻿﻿k defies expectations. Available for a meager price, it is the #1 best seller on Amazon. Thanks to its 4’’ length, you could tie this lock around your bike and attach the other side to a nearby object with ease. Moreover, since it is vinyl coated, this cable lock won’t get scratches as easily as most of the other cable locks. Lastly, if you’ve grown weary of taking care of that extra key of cable locks, this lock solves this problem with aplomb. It comprises of a keyless combination of a locking mechanism which means all you’ve to do is to remember the locking pattern. Finally, if you’re looking for a cable lock which is reliable, costs less than others, and is ideal for tool boxes, ladders, gates, and yes, bikes, this cable lock might merit your attention. First of all, let’s turn our attention to U-Locks. Being an optimum combination of price, practicality, and security, these locks could be carried around very easily. Moreover, since they are lighter and cheaper, U-Locks provide better security as compared to portable locks. Of course, there is no binding that you should use U-Locks. For example, if you prefer the ease which is on offer when you lock a chain lock or looking for a wide range of options, Chain Locks provide a better alternative. However, if you ask me, U-Locks are the best when it comes to portable security. However, if you’re looking for a lock that stays wherever you locks it, a huge, heavy chain is the best choice. Also, the heavy chain locks provide the best possible levels of security. Why? There are three reasons. First, it is virtually impossible for a power tool to attack a chain lock. They cannot be bolt crop and provide huge resistance to attacks from bottle jack. Also, if you’re looking to secure multiple bikes with one chain, they would do this as well. Folding Locks, just like U-Locks, provide portable security. In stark contrast to U-Locks which have a limited size and are difficult to carry around, folding locks have a longer length and provides better flexibility. Finally, talking about weight, they rival U-Locks in this regard as well. Let’s start with Abus. As their price tags might suggest, they produce the best quality locks. One thing which alienates Abus locks from the other ones is the rigorous testing mechanism. For example, from reaching the assembly line to the shelf of the consumer, Abus locks undergo various tests to ensure their efficacy. Also, they provide the best strength to weight ratio. However, as I’ve hinted at the start of their introduction, they are the most expensive ones. Turning our attention to Kryptonite, although their level of quality couldn’t match that of Abus, they make up for it with their brilliant customer service. With several anti-theft protection schemes, their Customer Service is simply the best! Thirdly, OnGuard doesn’t have a burgeoning reputation when it comes to quality and customer service. However, learning from the above mentioned brands, Abus has improved in the areas of quality and customer service in the past few years. Finally, if you aren’t swayed away by their quality, they’re the cheapest. Lastly, Amazer come into play. Though not as famous as any of the preceding lock brands, they have made a name for them in quite a short time. Why? As you might have noticed from their lock which we have mentioned earlier, Amazer has a knack of giving high quality locks in cheap prices. However, when it comes to quality, Amazer doesn’t top the list in my opinion. From the above-mentioned description, we can conclude this: Abus locks provide the highest quality but are expensive. Kryptonite locks boast the best customer service but lack in quality. OnGuard, despite lacking in both quality and customer service, stay in the race thanks to their low price. If you’ve followed with great attention the three simple steps, we are sure that you have already decided which bike lock is the best one for you. 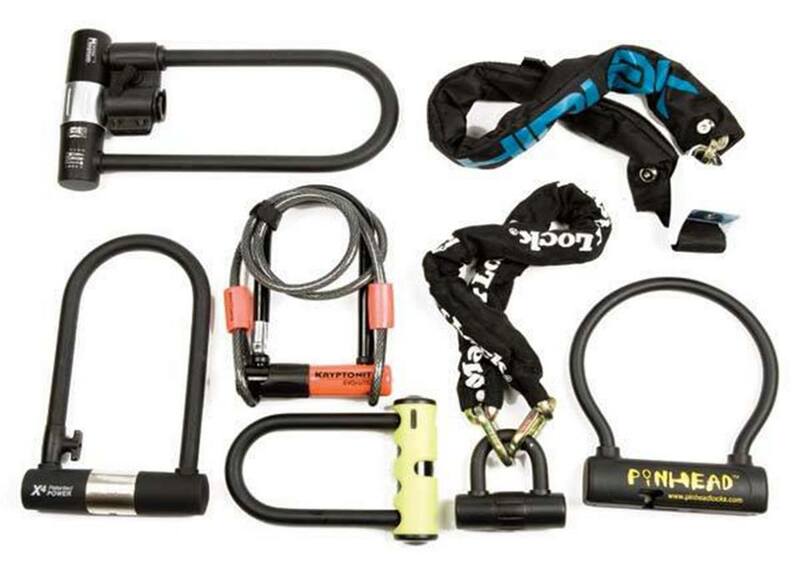 ​How Much Money should you spend on a Bike Lock? As you might have deduced from the above-mentioned description, the quality of a bike lock is directly proportional to its price tag. In simple words, the more expensive a bike lock, the better quality it would offer. Talking about lock brands – and while you might say that they’re biased, most of them give a very good advice: Spend 10% of your bike’s cost on your lock. However, provided that you have spent $200 on a bike, and are looking to follow the “10% rule” in purchasing the bike lock, your bike might not agree with it. Hence, if you can afford it, spend as much as you can on purchasing a bike lock. Also, if you want the maximum peace of mind, this much spending would also afford you just that. However, if you don’t want to spend astronomically on a bike lock, remember one thing: the best bike lock last many years. Hence, while their upfront cost could be more, the best bike lock have NO running cost whatsoever. Thus, again, spend as much as you can on getting the best bike lock. ​Do You Need more than One Lock? Although this question might seem ridiculous at first, the fact that two locks would increase the security level of your bike shouldn’t be neglected. For example, if you’ve used one lock to secure the wheel, the second lock could be used to secure the frame, or the other wheel, or the seat. Hence, if you can afford, going for two locks would increase the security level of your bike. However, before you go out and purchase the second one, remember this: two bike locks means an extra key and extra nuisance of making it secure. Thus, if you can afford the nuisance, only then go for an extra lock.